The below colour chart give you a clearer idea of how the nail colours in this series, Mod About Brights Collection looks like. This season, OPI goes mod-ern with Mod About Brights, the newest selection of shades in the Brights by OPI line. 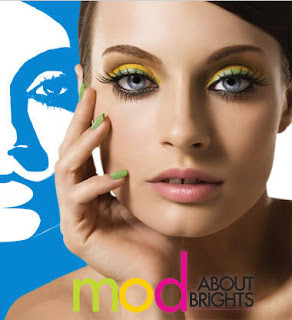 Mod About Brights captures the fun and edginess of the mod “invasion” of the Sixties, but with a bright twist that makes these colors exciting and current for 2008. And with fashion right now being all about strong color and vivid, graphic prints, these are the shades that look up-to-the-minute on fingertips and toes. If you love color, you’ll be Mod About Brights!